As you already know, your Intranet comes with a large number of abilities and features, and can be customized to do or be basically anything your organization needs. One of these features is the ability to create separate portals on your Intranet for different groups of workers. Physicians handle a lot of information that is different and more sensitive than that of other areas in the organization. 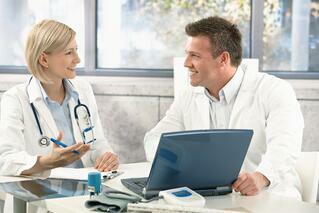 Here are some benefits to making a separate board for physicians on your Intranet. Organizing each piece of information that physicians need into one portal will make tasks quicker and easier. A physician portal saves time by not having information spread throughout the Intranet for physicians to find. Instead, they know the exact places to go for the data that is meant for them. In turn, work flow will be more concise and less overwhelming. With the amount of content Physicians are expected to digest on a daily basis, keeping their vital information concise and centralized in one location can increase readership. Physicians deal with a lot of sensitive information – particularly patient data, satisfaction results, incident reporting and so on. You’ll want to be sure that not just anybody has access to this information on the Intranet, but only those who are allowed to see it. Creating a physician portal makes this sensitive information more secure. Increase security by adding login credentials to get into the separate portal, and add passwords to get into certain areas of the new portal. The separate board can also be a place for physicians to message, blog and keep a news feed of conversation, news and information that is specific to them. This portal can allow physicians to collaborate online, share documents or meeting minutes in real-time. This provides a space for them to consult that won’t disrupt or become mixed in with the overall Intranet. Since the Physician pages are an extension of the Intranet and not an external or separate portal, switching back and forth between each portal or working on both of them at the same time is extremely simple. The physician portal carries your organization’s branding and values throughout, but it simply tailored to your physicians to keep information more organized and concise. These reasons are also great for setting up separate pages for all departments, such as nursing staff, marketing, HR, etc. Giving each group of workers their own space for their tailored information improves organization and workflow for the company as a whole.